People don’t resist organizational change! – People resist being changed! Most people have experienced some sort of change in their working life. Starting a new job, moving offices, leaving a job, down sizing, expansion, getting a new boss, reorganisations, new corporate strategy etc. All this affects us emotionally. If you ask people what they think of change, surprisingly many will say that change is good. That is because organizational change is usually presented as a mean of improving something. In fact in many cases even lay-offs can turn out good. I know that this might seam like a provocation, especially with the financial crises that we have in the world today. But for some people the lay-off can be the driving force they need to create a personal change in their life. I have seen this many times, and also, experienced it myself. Existing Networks is destroyed which creates uncertainty and insecurity. BOHICA stands for Bend Over Here It Comes Again, and is a common term used to illustrate people’s reaction to organizational change programs. Many people have seen projects launched and then nothing more, or big programs that don’t result in any major changes. The problem with BOHICA is that it undermines the belief in change programs. If organizations have a lot of BOHICA floating in the corridors you can hear people say things like: “that didn’t work last time, why should it work this time?” or “I don’t believe in this”. 1. The goals and purpose with the organizational change has not been clearly communicated and understood in the organisation. 2. The project has not been closed properly. When you close the project it is vital that you refer to the goals and purpose of the project and what you can learn from the change process. But the change curve will look different for every individual. Some people have more negative experience from organizational change or perhaps have not seen any positive results from changes. These people will probably have a more dramatic reaction to a change than other. We all react when affected by organizational change, but not in the same way or at the same time. 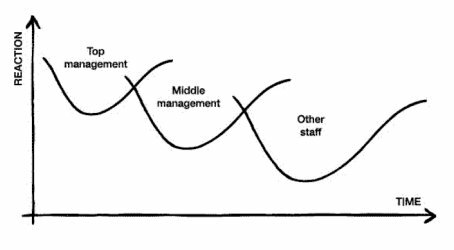 Most people don’t realise that top managers also go through a change curve, but believe it or not, they are just people to. And they don’t practically enjoy upsetting people. 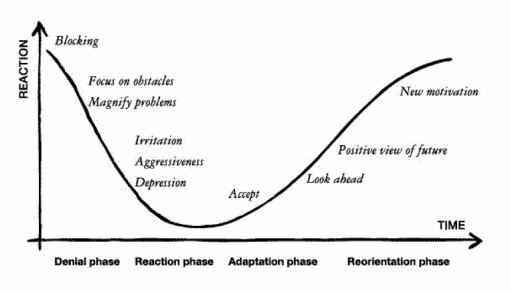 The thing is that the organization does not usually hear about the change until top management have been through their reaction phase. This is also a part of the problem. Many times top management do not realise that the rest of the organisation is starting from zero. 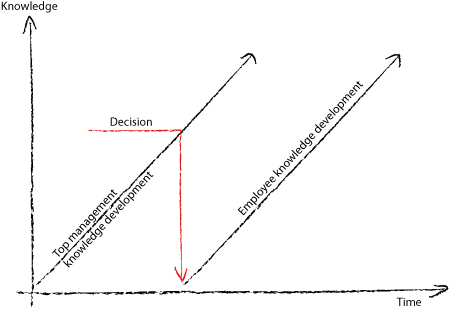 This is what is called the motivational gap and is one of the biggest communication challenges in organizational change projects. 1. How do we get management to realise that everybody else start from zero? 2. How do we get employees and middle management on board as fast as possible? Another problem that the top management has to solve is, how to handle middle management in the process. Since they are key communicators in the organizational change process and they are not doing a very good communication job if they themselves are heading down the change curve. If they regard themselves as losers you do not want them to be in charge of communication. They either have to be included in the process in an earlier stage or, they have to be by-passed. The best way to handle this is to give them extra support and information and security in the change. The first thing is to understand the difference between one-way and two-way channels, and to properly analyse the communication system that you have to day. How you can change this system, so that it is more effective in your change work. The communication system contains of channels, target groups and messages. And it is the proper mix of these that make the system effective. Basically it is all about understanding the need and background of you audience. 1. When dealing with organizational change it is important to understand that the more important the message is for the target group, i.e. affecting their lives, the more personal channels you need to use. 2. Don’t use one-way channels, such as Intranet, billboards, papers or email to first announce the change. 3. Be prepared for reactions, be there and answer questions. Their will always be answers, make sure that it is your answers. The absence of manager presence is always a good foundation for rumours. If you have an effective communication system you have built a system that looks at channels, messages and people in the most effective way. That means that you try to use one-way communication channels to one-way messages and e.g. don’t use the first half time of your meetings reporting one-way messages, but rather having two-way discussions. When you are working with organizational change you will need to have an effective communication system. There need to be regular meetings in your system. You might also need to have extra meetings of course. People will react to the change; the best way to control the reaction is by using your meetings. Put the change on the agenda, at every meeting. Dialogue is the most important tool to use when working with change. What dialogue does, is giving people a chance to react together with others. The definition of dialogue is when a group of people find new knowledge together. Be aware of false dialogue, called discussion. Not the same. When dialogue has the goal of finding new knowledge or solutions, discussions usually lead to consensus, which in practice is a way of finding a compromise. Dialogue might end up with something that is not the best solution for the individuals but for the group. A very good way of using dialogue in a organizational change process is to find the “HOW’s”. Meaning, the overall message is the “WHAT” the change is and “WHY” the change is necessary. The “HOW” is a way of finding solutions, and the perfect way to raise knowledge of the change and to gain commitment to the change. People are more lightly to be committed to something they been a part of creating than rather just being told. In most changes there is always people who see them selves as losers. One of the most important things you probably can do in the change process is to prepare messages to meet the losers. Try to figure out what arguments they might have. Address them pro-actively, don’t wait until they raise their voice, many of them will not do that. One of the most important roles that managers have is the role as change leaders. This is such an important role because the local manager is the only one that can properly change employee behaviour and attitudes. Why? Well, because the local manager knows about the local situation and understands the language, which means that, the manager can translate messages to “what’s in it for me” and create a common picture of the change and its consequences. Being a change leader include things like: create buy-in to the change objectives and goals, create a sense of security and a will to change, have a dialogue about consequences of the change, and to walk the talk. The big problem is that most managers do not have sufficient experience or training to handle change. Some are natural talents, but most managers are uncomfortable with these issues, because it affects people’s lives. The change leader (or change agent) is one of the strategic roles a manager has. From experience, from meeting thousands of managers over the years, we can see that most managers only spend very little time each year on strategic issues such as change or vision. Most of the time is spent on issues that are about solving problems in the daily work and coaching staff. Managers need support. They need help with communication planning, understanding and prioritizing messages, knowledge on how to handle reactions and how to create an arena for reaction. They need help with messages targeting people that are losers in the change process. Help with how to create understanding and commitment. It is always a good idea to be proactive and to try to find out what rumours and worry that are circulating in times of organizational change. Let me give you a very simple model for measuring this. You need to get somebody external (can be somebody from HR or Communication departments) to facilitate the measurement. 1. Gather 5-10 people (on the same level – non reporting) for a 60 minutes group interview. 2. Prepare a questionnaire (4-6 questions, only 3-4 alternative answers, no open questions), see example, and make copies for everyone. 4. Have participants place a film over the questionnaire and mark the top right corner with an “X”. Fill out the questionnaire on the film and hand in the films to the facilitator. 5. The facilitator gathers all the films and places them on top of each other (with the “X” in the top right corner. 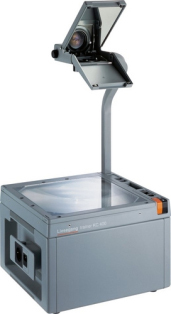 Place the films on the projector and show them one by one. 6. Have a discussion with the participants regarding the results. Use questions like: “why do you think it looks like this?”; “what would be better?”; “Do you have any ideas…?” etc. Normally when you put a number of people in a room, some of them are more extroverts than others. You want to have all the participants’ opinions, not only the extroverts ones. The way to do this is, first: make sure that you don’t ask people to volunteer in the survey. This will normally attract those with strong negative opinions. You want to have a true picture of the reality. So, select participants randomly. The other thing you need to do in order to get everybody to talk and share experiences id to use dialogue techniques, such as; ask a question and let people answer in order around the table; or ask a question and let them discuss in pairs before going around the table. There are two things to this survey that you need to analyse. The first is the answers to the questionnaire. This will give you an indication to how people think and feel towards the change and the future. If you perform this survey in different departments or areas and repeat the survey in time, you can also see trends and results. But be ware of that this is not a statistically good result, because of the low number of participants. The other thing you should look for in your analysis is the result from the discussions. This is where you will notice rumours and problems that people see. You will also be able to see ideas and solutions if you have asked the right questions.